Originating in North India, ‘chaat’ is a savoury street food that is today popular throughout India. The word ‘chaat’ literally means ‘lick’! Common types of chaat include pani puri, papdi chaat, bhel puri and raj kachori. The popularity of chaat in Sydney has slowly increased over the last decade, with many Indian restaurants now offering some form of it in the ‘Entrees’ section of their menu. Maya (Surry Hills): established in 1985, Maya is one of the original favourites in the Indian restaurant scene. Almost 30 years on, it remains true to its reputation. The papdi chaat ($5.90) is just delicious – the fried crisps are really light yet crispy and the mix of chick peas, potatoes, yoghurt, tamarind and mint chutney is perfect. Chaat Khaz (Harris Park): a new entrant to Harris Park’s Wigram Street precinct (otherwise known as ‘Little India’), Chaat Khaz really impresses with the huge variety of chaat on offer. Try the pav bhaji, which is a dish made up of bread which you dip in spicy vegetables wtih a dollop of butter on top. Delicious! Try one of the many spicy Indian sodas on offer. Taj Indian Sweets & Restaurant (Harris Park): an old-timer on Wigram Street, Taj is a vegetarian, casual diner style establishment, serving up great chaat. Try a combination of the samosa chaat ($8.90) and pani puri ($6.90). Delhi ‘O’ Delhi (Newtown): another well known spot in Newtown, Delhi O’ Delhi serves an excellent khasta raj kachori ($14), which is a puffy pastry called ‘puri’ filled with potatoes, chick peas, date and tamarind chutney, yoghurt and mint sauce. Abhi’s (Concord) / Akhi’s (Woollomolloo): if you’re in the mood for a refined take on the popular street food, head to either Abhis or Akhis, the latter of which is the only hatted Indian restaurant in Sydney. The palak patta chaat ($16.80), which is a combination of spinach leaves, a crispy lentil batter, yoghurt, and date and tamarind, chilli and mint sauces, is just divine. 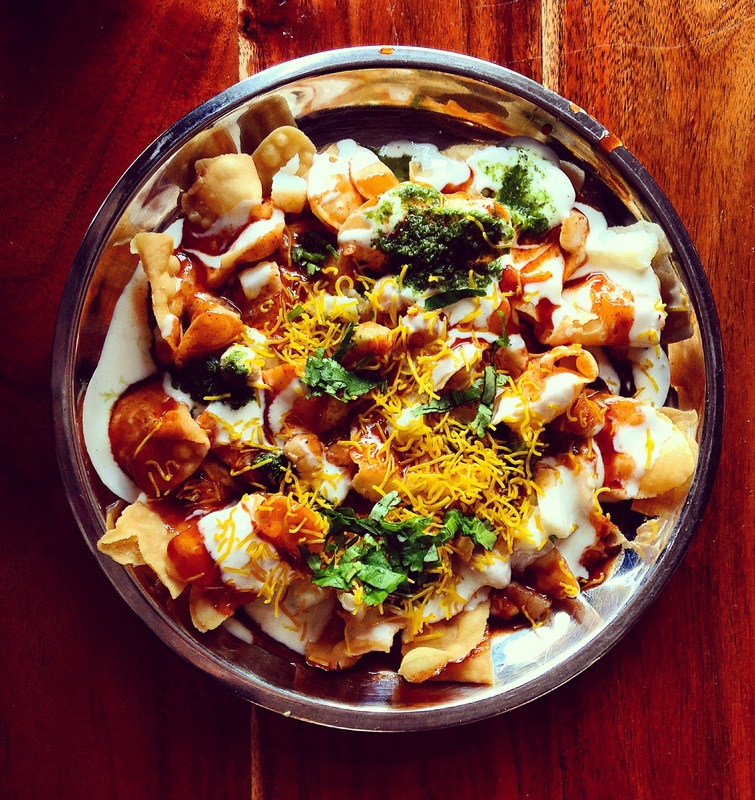 This entry was posted in Uncategorized and tagged chaat, indian, Sydney. Bookmark the permalink. ← Baker Bros – cafe or bar, take your pick!